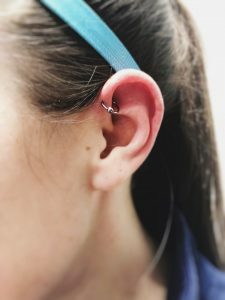 What is a Forward Helix Piercing? 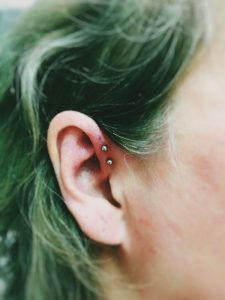 A Forward Helix piercing is done on the upper part of the ear cartilage, or pinna, just above the tragus on the part of the cartilage that faces forward and is closest to the face. 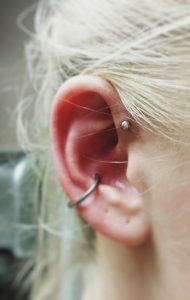 This piercing has been increasing significantly in popularity and it is common to see multiple piercings in this area. What Is the Healing Time for a Forward Helix Piercing? Generally, full healing takes place over 6-12 months but can take longer depending on the number of piercings, the quality of the aftercare regimen and other factors such as general health of the person who got the piercings. Though each body is different, and healing times can be longer or shorter, depending on the health and lifestyle of you, the piercee, and how vigilant you are with your aftercare routine. The first few hours after the initial piercing, the ear should not be touched at all. Begin doing your aftercare at bedtime on the day you get pierced. That first soak will feel amazing! Your piercer will give you a complete rundown of how to care for your piercing wound when you get pierced, but one of the most important is not to touch your piercing unless you’re cleaning it. Moving the jewelry will reinjure the area and lead to longer healing time, as well as leave you more susceptible to infections and possibly scarring. A selection of aftercare products are always available for purchase at Almost Famous Body Piercing. If you need to touch your piercing for any reason, make sure to wash your hands with soap and water beforehand. Due to the location of forward helix piercings, it is helpful to have someone help you occasionally with aftercare by having them check inside the fold of your helix for any built up drainage. Make sure the person helping you washes their hands thoroughly. If they do see discharge inside your ear after you are done with your sea salt soak, have them use a clean cotton swab to gently wipe the remaining discharge away from your jewelry. Use a clean swab each time the area is touched to avoid leaving any discharge from the cotton swab behind. You want to be sure to protect your new piercing(s) when using hair products, using your cell phone, and it’s always best to wash your pillow cases frequently while your piercing is in any stage of healing. Keep your hair pulled away from your new piercings, and if you live in a cold climate, make sure to protect your new piercings when you go outdoors. Forward helix piercings have grown in popularity over the past few years. Due to the location of the piercing, the look is very subtle, but will still give a sparkle to your overall appearance. Many people use a variety of gemstones in their forward helix piercings, like sapphires and emeralds, and many people trend towards jewelry shaped like flowers, to give a classic, elegant look to the piercing. Using gems of varying size adds interest, as does using different colored gems in each piercing. Celebrities like Scarlett Johansson and Demi Lovato have all been seen rocking the forward helix. Call Almost Famous Body Piercing today to speak with one of our licensed piercers about any additional questions that you have about the forward helix. They can answer any of your specific questions on heal time, piercing procedures, jewelry, and aftercare. You can also check out the Almost Famous Body Piercing Instagram for more ideas on trendy forward helix jewelry!